The good folks at Dark Hall Mansion are bringing Peanuts fans a treat with some tricks for this year's officially licensed prints inspired by the classic television special It's the Great Pumpkin, Charlie Brown. 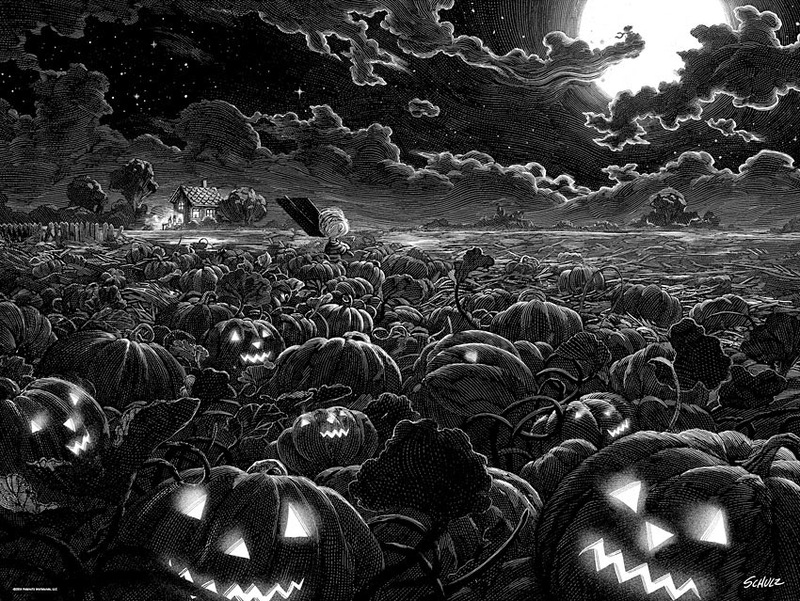 The print is available in three editions, with some cool options: a standard edition in stunning black-and-white; a sepia-toned variant edition with a glow-in-the-dark layer that reveals jack-o-lanterns grinning in the moonlight when you turn out the lights; and finally a very limited foil edition where select cutouts and brushstrokes let the foil underneath shine through. 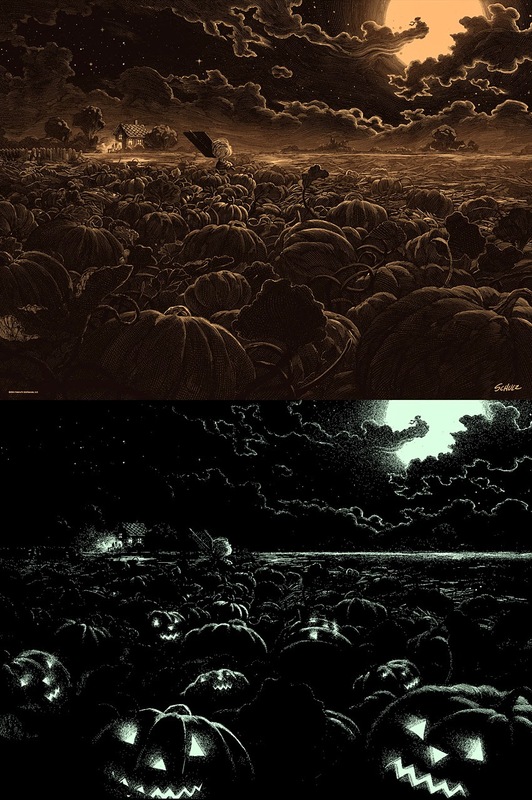 The officially licensed, numbered editions measure 18" x 24" and are screen printed. The standard edition will be limited to 280 prints, the variant edition will be limited to 50 prints, and the foil edition limited to just 15 prints. 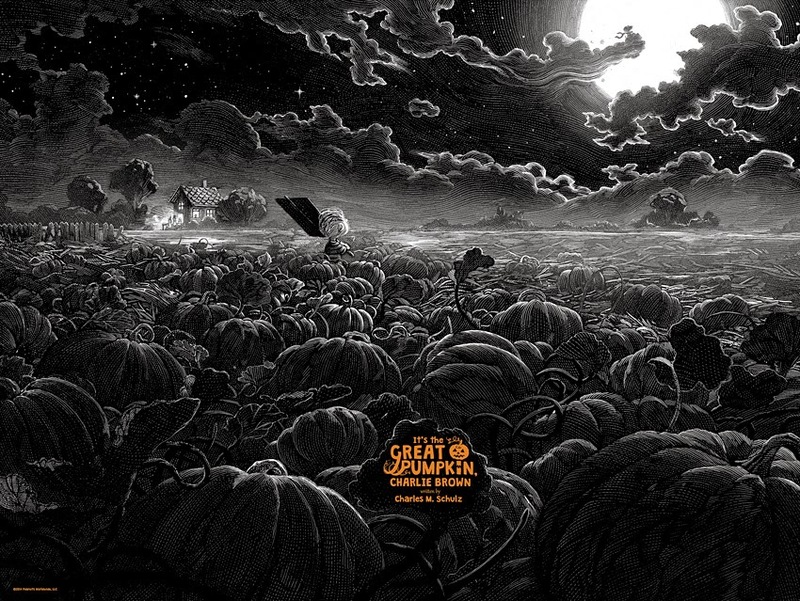 The 2014 It's the Great Pumpkin, Charlie Brown prints go on sale Thursday, October 2, 2014 (which also happens to be the 64th anniversary of the comic strip's debut) at a random time between 9:30 AM and 12 noon (Pacific time) at Dark Hall Mansion's webstore.